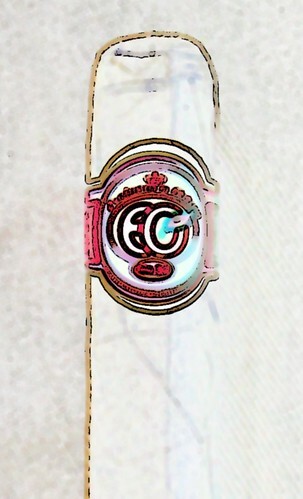 ← Bloggers top 10 Cigars of 2009? I was going through my Connecticut shade sticks looking for something to follow-up my first chapter of the “Connecticut Files” and I stumbled upon a stick I had completely forgotten about, the Espinosa y Ortega (EyO) No.21 Robusto, a cheap-ish bundle cigar made by the same guys who make the 601 black label I reviewed previously. I received this as a free “hitch-hiker” with a 601 sampler I traded with a US BOTL (Mike, my man!). How would the lesser sibling fare against the more acclaimed cigar? Also I was curious to see if the Panamanian tobacco would bring some interesting notes to the mix. This will be a short review, so no wasting time people, let’s rock! This cigar does look the part of the poor, ugly half-brother: the band is simple, cut a bit off-center and the foot cut is rough, The wrapper is a decent Connecticut shade, but is veiny, a bit dull and slightly ragged on the seam. On the other hands it feels quite packed but not too hard. The pre-light draw is nice and free, maybe a touch too much for my taste, but has no particular aroma. This is not a stick that evolves a lot, so no much sense in looking at the tree sections separately. On the construction side it smokes nicely: the thin burn line is almost perfectly straight, it produces lots of thick smoke and the ash is long, although a bit flaky. The flavours are pretty basic. It starts on some earthy tobacco with some spice and a very unusual finish, like horseradish (the Panamanian tobacco maybe?). Around the halfway point it becomes woody and earthy, plus some leather towards the end. The body is on the lower end of medium. Also it is a bit harsh at times, but never terribly so. For a bundle cigar I would say tis is not a bad deal; it is a de cent smoke, with some complexity which certainly is well constructed and gets a 79 points on my point-scale. Personally I will not buy this again, too much stuff to try out there that tickles my curiosity, but if you want a decent cheap smoke these aren’t bad at all. Although the 601 Black label is certainly a better quality stick, I found this EyO No.21 Robusto to be certainly less complex but also less tiring than its big brother. P.S. any opinions on the openin picture? This entry was posted in Blend, Cigar Reviews, Connecticut shade and tagged cheap cigars, Cigar Review, Espinosa y Ortega, Honduras cigars, Nicaraguan cigars, Panama cigars. Bookmark the permalink. I’m glad you enjoyed it… have a look on my review on this stick. Hi Spyros, sorry I missed the review -posted this while travelling, but I added a link now. Nice one! Thanks for this review….I will simply say I enjoyed it maybe a little more than you did. Thanks for the feedback Jim. 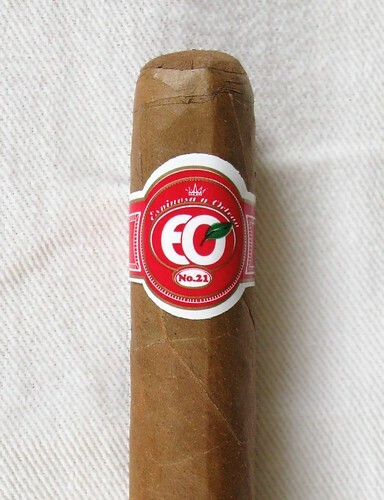 Generally I find EyO cigars very good and a lot of people seem to like these too, so it probably just is that these don’t fit my taste.